NBC's Mike Milbury on Bruins-Maple Leafs: "Place your bet on Boston"
When the Bruins and Maple Leafs suit up for Thursday night's Game 1 (7:00 pm on NBCSN) of their first-round playoff series, it will be with the legendary Mike "Doc" Emrick and former Bruins defenseman Mike Milbury in the TV booth broadcasting for NBC Sports, with former goalie Brian Boucher behind the glass. So who better to give a breakdown on the first-round series between the Bruins and Maple Leafs then Mad Mike himself? "[Toronto] has not finished well here," said Milbury. "I think it could go down [in favor of the Bruins] in five games. That's what I think." Milbury is interestingly picking the Bruins in five games in a series that he doesn't think will have the legs that it did last season when the Leafs pushed Boston to seven games before eventually falling. It's also clear that Mad Mike thinks the playoff series will play out with many of the same strengths and weaknesses as last spring, when Boston's offensive stars had their way with the soft, offense-leaning defense for Toronto. Sure the Leafs have added a rugged, experienced D-man in Jake Muzzin at the trade deadline, but he sees the same flaws with the Maple Leafs when they get pushed by dangerous offensive players in their own zone. "The matchups are interesting," said Milbury. "I get the sense… I heard that Mike Babcock had a summit meeting with [Auston] Matthews and they've been trying to get him to play two-way hockey all year. I think that matchup is going to [Patrice] Bergeron, and I don't think Bruce [Cassidy] is going to worry about Matthews vs. Bergeron. It will be an interesting match-up, and that leaves [David] Krejci vs. [John] Tavares and there's nothing wrong with that match-up. Then you get to the bottom lines and it's interesting. I've been disappointed in [Charlie] Coyle and [Marcus] Johansson because they just haven't produced anything. But it's a new game, new series and new start. The fourth line I like better with [Sean] Kuraly, but it's still functional, so it's a fairly even match-up with the forwards. But you get to the blue line and it's a different story, I think. "There's better depth, better experience and I give that edge greatly to the Bruins. I don't know if it will be quite as dramatic [as last season's first round], but I think Toronto will punish themselves by trying to play physically. Then they go to the penalty box and their penalty kill is at about 65 percent or something. [Freddie] Andersen was up and down in the playoffs as was [Tuukka] Rask, but I still give the edge to the Bruins in goal as well. I think the story here is that Boston will have a better ability to exploit the Toronto defense rather than the other way around, although Toronto has some horses now. It shouldn't be a layup for the Bruins this year, and it wasn't last year. But I do think the Achilles heel of the blue line for the Leafs is enough to place your bet on Boston." Where can things go wrong for the Bruins? "If they somehow lose their sense of structure on defense or if the speed of Leafs can bring a problem to the Bruins where they spread out the Boston defense, or score off the rush? Those will be telltale signs that it will be anyone's series," said Milbury. "[Zdeno Chara] is vulnerable to speed now and you can see that, but he's also smart enough to work around it. He's still good enough to play against top players in the league. "I'll be curious to see if [Mike] Babcock is going to put [Mitch] Marner on that side to see if he can make things uncomfortable for [Chara]. But if I'm right, the series will be won in the Leafs' end rather than the Bruins end. I don't see either team really spending a lot of time in transition. They'll spend time there, but the focal point will be getting it deep and getting on the other team's blue line to make them work harder. That's the name of the game here." 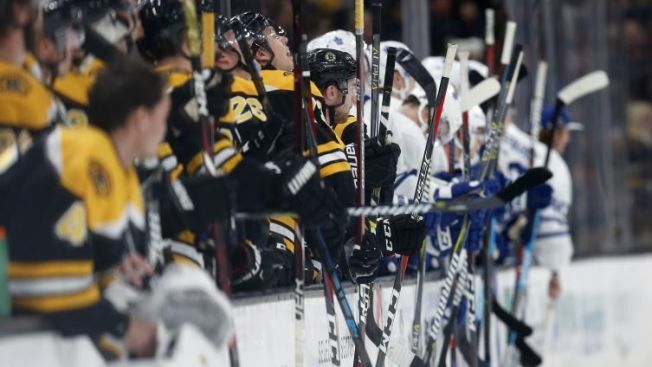 The consensus around the NHL is that the Bruins should take care of business against the Maple Leafs again this season after putting up a 107-point regular season, and earning home-ice advantage against Toronto. But it will be interesting to see if the series goes against convention, and toward Milbury's prediction, and the Bruins are able to close out the Maple Leafs a little more quickly than they did last spring.